Call: Sotik Sanderson on 0400885772. Email: Sotik Sanderson at hello@sotiksahna.com. 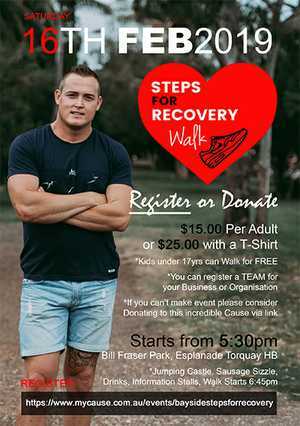 We have an incredible opportunity next month in our community to host our annual (national TPA fundraising event) Steps for Recovery Walk for 2019. The heart behind this walk is to come together and continue to build awareness of the effects drug and alcohol addiction has on our loved ones and our community. All funds raised, go directly back into the financial support of Bayside Transformations program, Hervey Bay servicing our Fraser Coast region and beyond in ‘transforming people’s lives for good’. We are a not for profit and non-government funded residential drug and alcohol recovery program relying solely on the incredible support of our community, residents, their families and events such as Steps for Recovery Walk; and as the saying goes “every little bit counts”. This is a family friendly event. There will be a jumping castle, sausage sizzle, drinks, information stalls and so much more. You can register online or on the day. We look forward to seeing you there!